‘In a sad city, the saddest of cities, a city so ruinously sad that it has forgotten its name, a professional storyteller named Rashid lives with his son Haroun. Rashid is the Shah of Blah, with oceans of notions and the Gift of the Gab. Ask the Shah of Blah for a story and you won’t get any old story. Nor will you get just one. You’ll get many stories, hundreds of stories, funny and sad stories, all of them juggled at once, complete with bits of sorcery and bits of love, princesses, wicket uncles and fat aunts, moustachioed gangsters in yellow checked pants and galf a dozen catchy tunes. 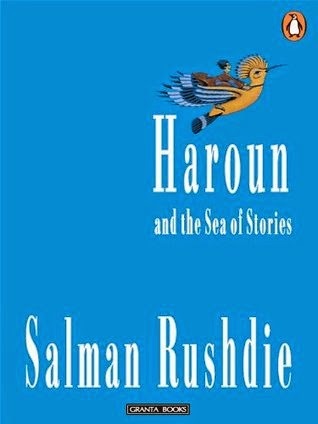 Haroun and the Sea of Stories is a Rushdie novel meant for younger readers and is dedicated to his elder son, Zafar (whose middle name happens to be Haroun). I read the Midnight’s Children and I wanted to read a lighter work of Rushdie after that and this seemed an obvious choice. The story starts at a city, the saddest of all cities, where lives one happy family, of the storyteller Rashid Khalifa with his singing wife and son Haroun. However, there comes a day, when, his wife leaves him and Rashid loses his ability to tell stories, and eventually is forced to leave the city on to the valley of K to support the campaigns of a cynical politician named Buttoo. Haroun, determined to bring back the ability of his father, happens to meet a Water Genie from the world of stories, steals his magic wrench and tricks the genie to take him to the world of stories, called Kahani so that he can bring back his father’s abilities and the story is about Haroun’s adventures in this world. To start with, I felt I got what I wanted – a novel for light reading, written by Rushdie and I guess there couldn’t have been a better choice than this. It was short, simple, but at the same time, wasn’t free from his exquisite imagination and imagery. I really loved his imagination and the way he described the world of stories – Kahani and the characteristics of the protectors of stories and the opponents of the same. It was very much an ordinary princess rescuing story (often told bed time stories) however, what made this special was the element of magic realism and the same happening in this new world (the unseen moon of earth, according to the story) – Kahani. I liked the way how Rushdie brought about the organisational structure of the army in Kahani – split into chapters served by pages (soldiers) and how, in spite of including a romantic sub-plot between Haroun and the page Blabbermouth, it didn’t affect the flow of the story in anyway and there was absolutely no digression. I also liked the names that Rushdie had chosen for the characters in the book but as I’m someone who can speak Hindustani (Hindi / Urdu), there was no element of surprise and the last page of the novel was unnecessary but for someone who doesn’t, it would’ve certainly been a good element in the novel. Of course, like any other bed time story meant for younger readers, it has a happy ending. The only two problems I had with this book was – some pointless imagery, especially inside the boat at the Valley of K and I felt Rushdie didn’t give enough room for the reader to interpret, either. Also, I felt the publisher gave away too many details in the write-up and also claimed this novel to be ageless which I’d disagree, for I certainly couldn’t appreciate this book as much as Midnight’s Children and I also believe that I would’ve appreciated this book a lot more had I been ten years younger. I felt this is a very good book for anybody start their foray into books and reading considering the quality of writing you’re exposed to at a young age; and I believe, had I stumbled upon this earlier, I would’ve got into this much earlier than I did, which happened to be at the age of thirteen. If any young reader asks me a suggestion for a book to read, this would certainly make it to the top of the list that I’d be suggesting. Kudos to Rusdhie and I shall soon be reading Luka and the Land of Fire (I already have it in my shelf). Rating 7 / 10 (I’m deducting one, probably because I’ve read it ten years too late). 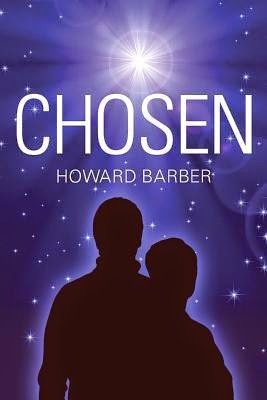 Chosen is a spiritual novella with a good mixture of elements of normal science fiction. The story is presumably happening at a time in the future where a group of senior citizens (SASCs) led by Howard and Bonnie and they’ve a very important task; choosing the next great person who could set things right in the world and bring them in line with the will of god. However, their task is not that easy and their mission isn’t well conceived by established religious institutions and one of the identified candidates of Howard – Emily, that is, comes under attack. The story revolves around the recovery of Emily – who is taken care of by SASCs and a part of her body is replaced by a robot and subsequent to that; her self-realisation and then, moving towards the mission of attaining enlightenment. I did like the concept of this book – of merging science fiction and spirituality in the same story, which is rather unusual and I felt the author didn’t drag it too long and came straight to the point. I really liked the parts of the book, where Emily was still recovering from the accident, how she had to learn to use her abilities and use it towards her mission and it was brought out very well. Moreover, unlike other stories surrounding spirituality, the mission of the protagonist was rather unambiguous and there was no digression from the author and last but not the least, the story was short and sweet. However, with that being said, I’m someone who personally believes that it is nearly impossible to bring science and religion in line with each other and most often, are contradictory to each other and I found the idea of a scientist believing in a chosen one to be … rather unusual and illogical. Moreover, I felt the, book required some consistency – for a while, the entire story was in third person and after the departure of Howard, it shifted to first person from Emily’s perspective and eventually, towards the end of the book, it became a first person from her brother, Curly’s perspective. Moreover, there were a lot of editing issues – such as using spellings such as ‘genious’ or phrases like ‘principle mission’ but I’m willing to overlook all those as those are errors for which, I'd always give the benefit of doubt to the author of possible oversight. Moreover, I felt the references to Christianity are difficult for someone from other backgrounds to appreciate, including myself. On the whole, I felt this novella is good for light reading on a short journey and could be enjoyed by those who do believe that science and religion can get along with each other. On the whole, I had a satisfying experience reading this book.